The shuttle bus rattled down the resort road, filled to standing capacity with happy children and cheerful parents, and pointed toward the most visited zoological park in the world. The sides of the bus were wet with morning dew, as the morning air held faint traces of the previous evening’s relative cool. Tucked into a section of contoured plastic seats, our touring group – me and Amy, brother and sister Rich and Hydee, and their mom JaNae – was more subdued. We had left our rooms that morning just ahead of 9:00, which was not bad for a collection of inveterate night owls on vacation. But, in trade, we seemed to be operating on essential systems only, and our usual discoursing had been replaced with bleary silence. Usually the vultures hang out in Splash Mountain. From my seat I could watch our distant gazes and vacant expressions. We looked like commuters on our way to another eight-hour stretch at the office. I always say that I could live in Disneyland, but if we were already starting our mornings with thousand-yard stares, then maybe my reservoir of Disney devotion was not bottomless, as I had always thought. 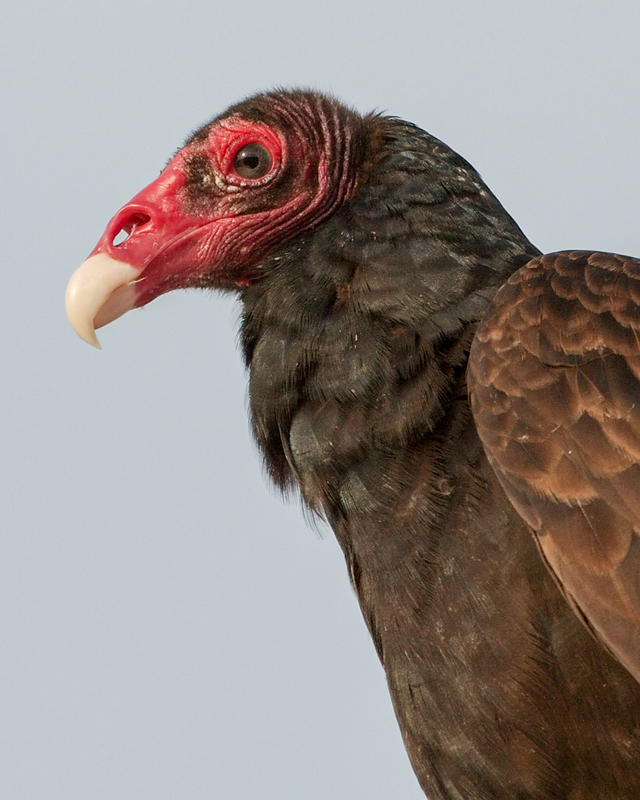 In the skies above Disney’s multi-million dollar animal conservation park were a dozen vultures, turning lazy circles. Comparison is the death of joy. Our ambitious Walt Disney World vacation was about to get real. 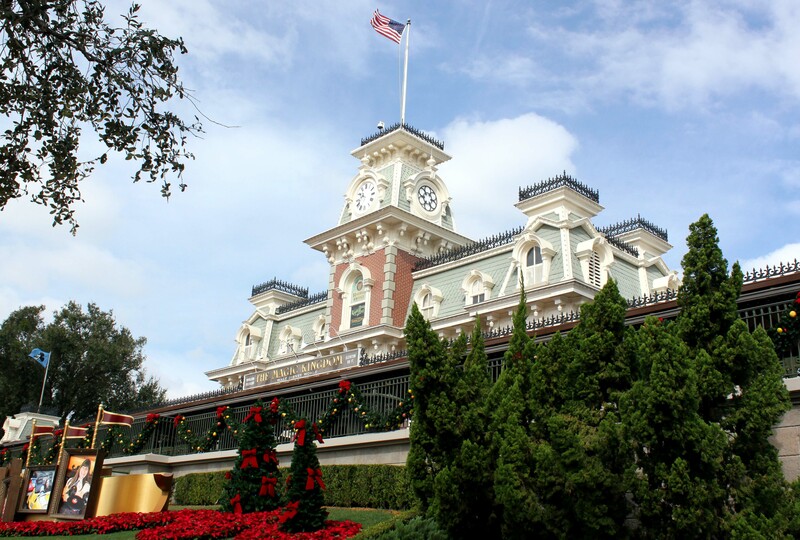 Magic Kingdom was almost instinctively familiar to us, being the East Coast version of our home park, Disneyland. Day four would be our first visit this trip, and we could not have been more excited about it. Our touring group was Amy and I, with our friends: siblings Hydee and Rich, and their mom, JaNae. This view has never failed to make us happy. A swirling breeze and low, 50-degree Fahrenheit temperatures greeted us as we left our rooms, which was a change from the warm, wet blanket of air from the previous mornings. I was still in the shadow of the towering, Callipygian Ursula when I wondered if I should double back and grab my coat. But, no, I would manage. I was confident that my decision would not come back to haunt me at the end of the day. At last, after months of planning and daydreaming, and one long-and-winding travel adventure, we woke up to our first full day at Walt Disney World. The last person to snicker at this view was turned into a sea slug. After a week of clear skies and unseasonable heat, we woke up to rain on the morning of Saturday, October 20 – our last day in the park. We did a quick mental inventory of our previous trips and arrived at the conclusion that neither of us had ever been rained on before at the Disneyland Resort. We were breaking new ground, even at the end of eight straight days at the parks. 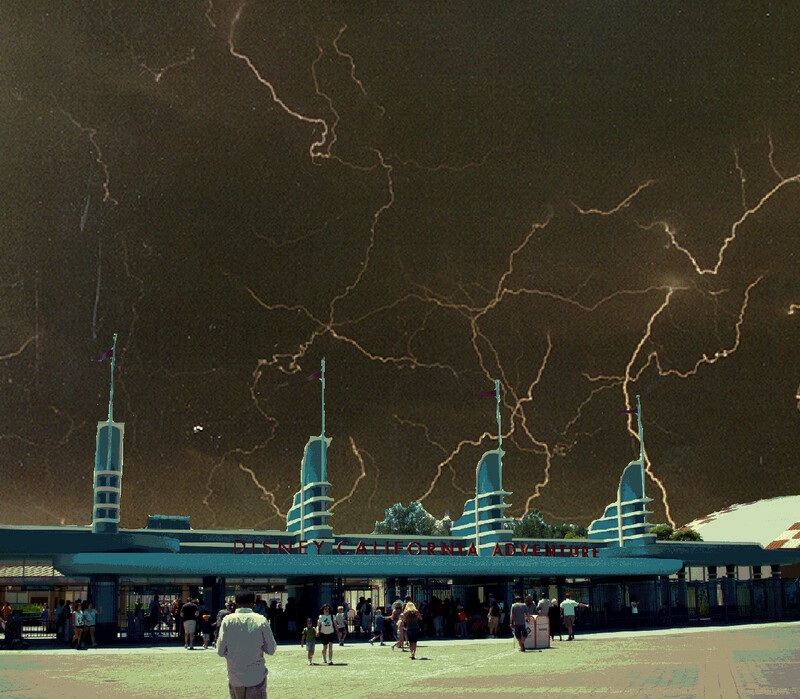 A composite image of the storm, from the perspective of the less adventurous hotel guests. The crowd was light at the familiar intersection on Harbor, with locals and tourists holding off, we guessed due to the precipitation. The rain itself was light enough that we were not bothered, and it had broken the heat, which was welcome. It may have taken a week of unseasonable heat, but the cool weather we hoped for had arrived. We had late morning reservations for Storytellers Café in the Grand Californian Hotel, a character meal that had turned into a tradition for our little two-person family. 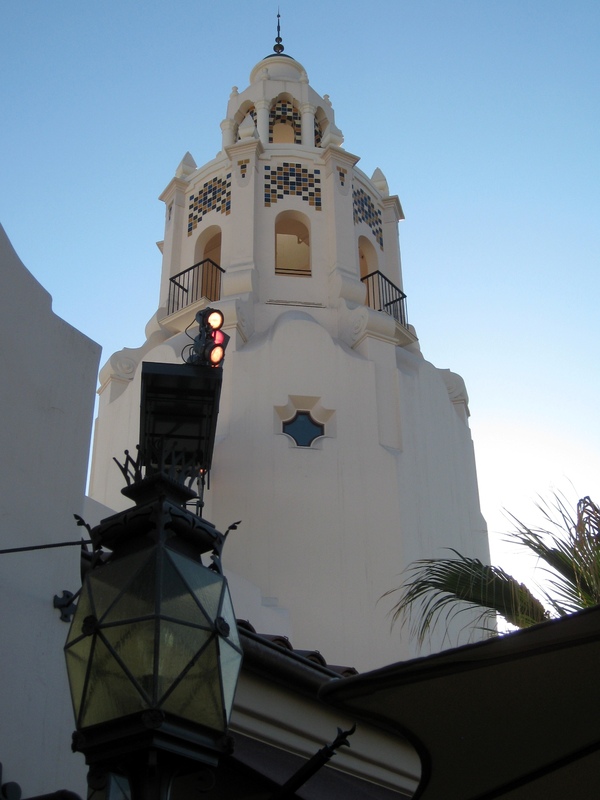 With over an hour before our assigned time, we thought it might be fun to go by way of Disney California Adventure and use the connected hotel entrance from the park. We are Disneyland Marathoners, to put a label for our park strategy. For anyone counting, this post describes our seventh and eighth days of vacation, and subtracting the travel time, our sixth and seventh straight days visiting the parks. 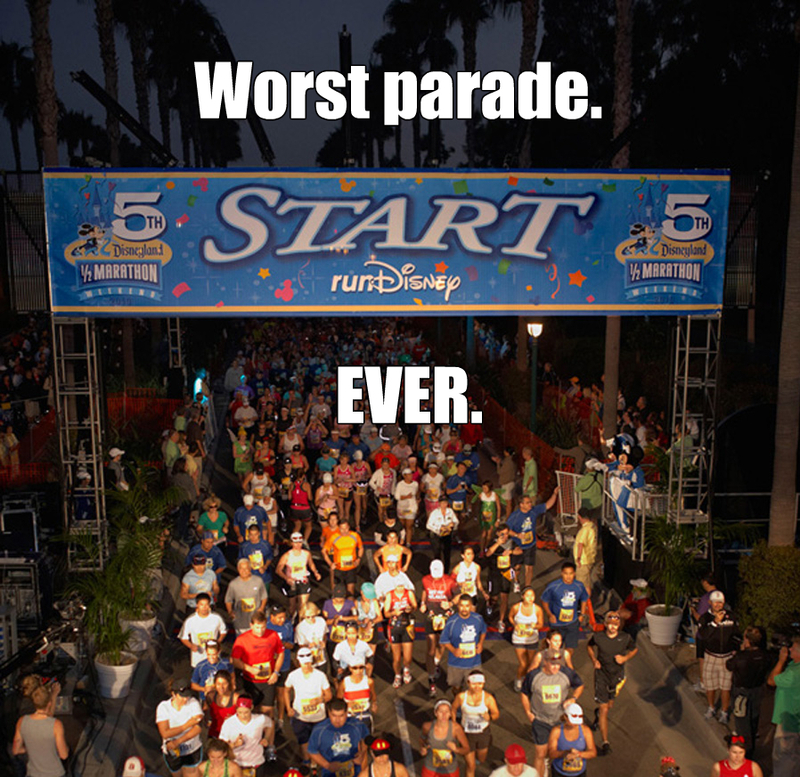 Plus, when we are in the parks, our efforts are equally marathon-esque. We spend long hours on the go, always engaged, observing our environment, rarely sprinting, but with practiced motion. Don’t bother looking for me in this photo. I am not there. When I speak with friends and colleagues about our Disney vacations, most express amazement at how we could spend so much time in one place. This is something I suspect is heard by many of our compatriots in the Obsessive Disney Fan Community (in which, frankly, we are relative lightweights): Don’t we wish for other adventures? Well, of course. We don’t take every bit of our yearly vacation time to a Disney park, after all. We love travel, period. But when we are here, we are focused on Disneyland. We circle it on our calendars, we develop an approach, we reserve our time, and we plan everything we can in anticipation. Just like any good marathoner. Amy and I have travel rituals. Rituals for road trips, rituals for camping trips, rituals for airplane rides, and rituals for almost every other aspect of our vacations. Of course, it goes without saying, we have rituals for Disneyland. For example, every time we go, we do something we have never done before at the Disneyland Resort. First, the Disneyland Resort is much bigger than it seems. At a bit over 500 acres, the current, developed property can feel claustrophobic for two theme parks and a shopping district, especially when compared to Walt Disney World’s 25,000 acres. But there is a lot packed into that space. Second, the Disneyland Resort is always changing. 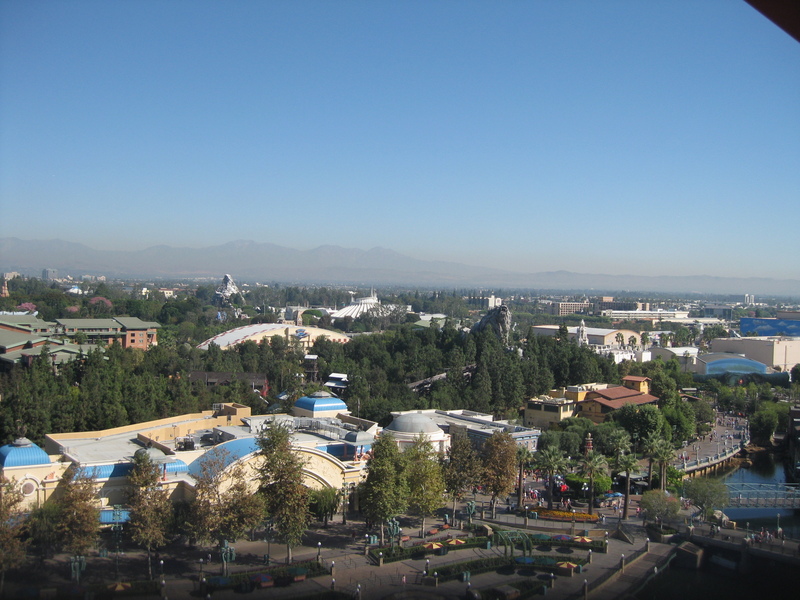 Walt Disney originally bought 160 acres for Disneyland, to address the first point, but it is not just expansion. 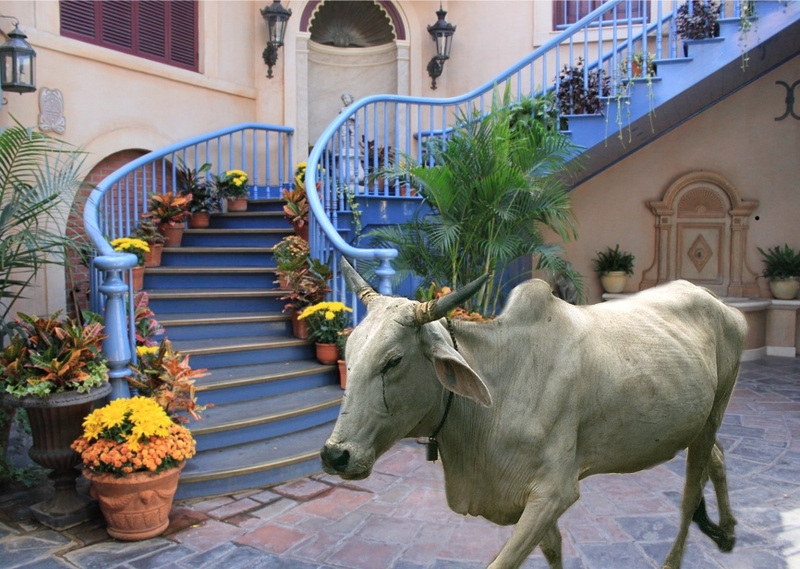 There are very few sacred cows at Disneyland and change is the only constant, as management develops new experiences and opportunities for guests just like us. This is not always met with widespread public enthusiasm, but they do it anyway. Like many others, my job has become 24-hour-a-day presence in my life. Even in a full-immersion place like Disneyland I am often on my phone, checking work email or voice messages, and answering text messages. It’s not that I am irreplaceable to the company; if anything, the opposite is true. I keep in touch with the office so I can maintain whatever shred of standing I have achieved. Amy understands my dallying with work during our time together, but wants me to keep it brief, where possible. This version had a better ending, but wasn’t quite as funny. An extended break from the daily grind was once considered essential to a healthy constitution, but that line of thought has disappeared like poodle skirts and leaded gasoline. The structure of a vacation had become a fluid concept. Grand tours and summers abroad sound self-indulgent, and things our parents did to unwind are out of vogue. The road trip, once a quintessential American experience, is as dated as the Griswold’s pilgrimage to Wally World. I have a theory that vacations can be restorative even if they are not relaxing. More important than lounging in a chair or lolling in a swimming pool is separating from the daily routine, which is the real key to getting away. The most remarkable vacations have included more than just a change of scenery. They may not be the easiest, but they are the ones where I returned the most fulfilled. I think of it as becoming a short-term “citizen” of the vacation. If everything went according to plan, our fourth day, Monday, October 15, had the potential to be the most unique and exciting of the entire trip. For one thing, we were attending the special-ticket “Mickey’s Halloween Party” at Disneyland with everyone that evening. But more than that – and this was the really big news for us – our already-sizable company would swell by another eight people. The Duffins were coming. Disneyland may be expensive, but there is no extra charge for the heat and the smog. 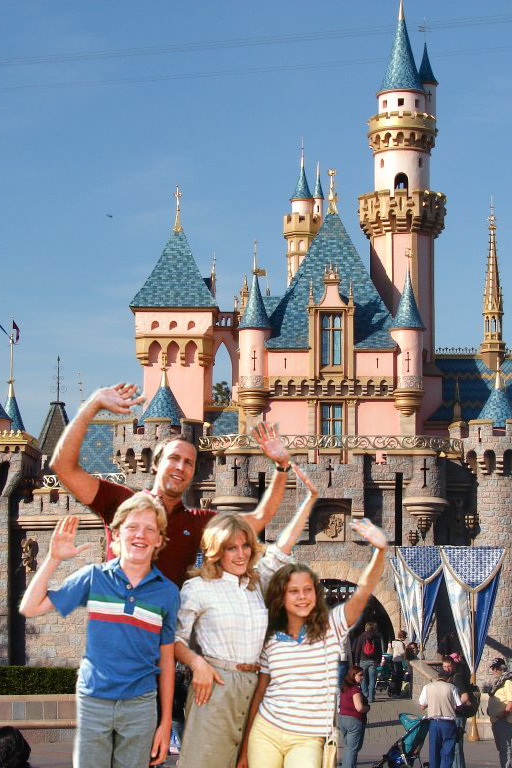 The Duffins had never visited Disneyland as a family. Joel, the dad, was last there in 1992, which was the year before Mickey’s Toontown opened, for Disney history/trivia fans. Julianne, the mom (and Amy’s sister), had not been since 1988, which was the summer before Splash Mountain debuted. They had met, married, finished school, had kids, worked, played, went to piano lessons and soccer games, served their communities, and lived full lives, but neither had since set foot in The Happiest Place on Earth. At least once per vacation Amy and I snooze our alarms too often and have to rush to make a morning deadline. On day three of the trip, October 14th, my parents had made reservations for the entire group to enjoy “Minnie & Friends – Breakfast in the Park” at the Plaza Inn in Disneyland. True to form, we erupted out of bed like flushed grouse about forty-five minutes after the alarm started going off and started the day with manic action. So far, we had enjoyed an unhurried, high-calorie, high-carbohydrate breakfast at Mrs. Knott’s Chicken Dinner Restaurant. Today, we had another leisurely, gluttonous meal with Minnie Mouse and her friends at the Plaza Inn. Our phones were bleeping with text messages from my Mom as we flew out the door with minutes to the reservation deadline. She was making sure we were well on our way, and, fair to say, we were not. One of the most underrated pleasures of being on a vacation is the happy reconciliation of waking up in a strange place, your head still blank with sleep, and then at once remembering where you are. The day is stretched out ahead of you, brimming with potential, and you can either surge out of bed to start your adventure, or you can shut off the alarm clock and roll over to catch more sleep, depending on your tastes. The new, big wienie at Disney California Adventure. Amy and I are both prodigious sleepers, so it was a little surprising to find us with the Subaru re-packed and ready to continue down the road by 7:45. Morning people or parents of young children would not find that remarkable, but for us, on vacation, it was an accomplishment. We chalked it up to the proximity of our goal destination. 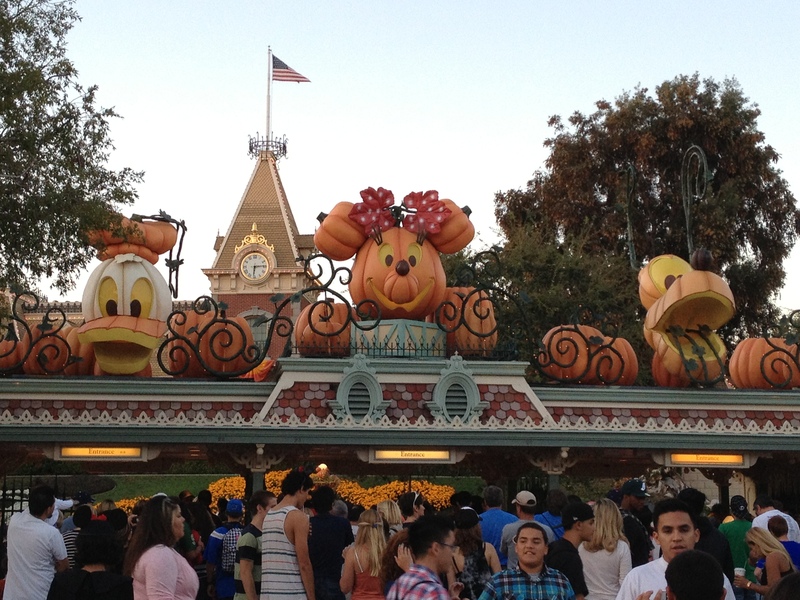 It was Saturday, October 13th, and the Disneyland Resort was a scant 80 miles away. The road-drunkenness of the previous night had dissipated with the new day. The Subaru took us over the Cajon Summit, past the Mormon Rocks, and began descending into the Los Angeles area, the miles ticking off behind us faster than expected. In no time at all we exited from the freeway, found Harbor Boulevard, saw the tall structures of the resort, and arrived at our home base for this trip: The Anaheim Desert Inn and Suites.